The late distinguished American poet, Hayden Carruth, wrote of native Mainer, Patricia Ranzoni's first collection, "Her poems have the pizzazz that real country speakers, close to earth and to each other, invent all the time. At the same time, her good sense and wise feeling are womanly in the finest sense and her pleasure in this is evident. 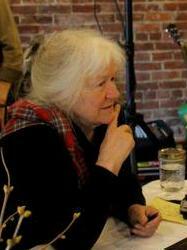 Her voice adds significantly to the imaginative expressiveness of New England." All of the poems in the 105 page book have been chosen for inclusion by editors of paper and electronic journals and collections across the U.S. and abroad; and Ranzoni's work is drawn from for classes in writing and history in Maine schools and colleges. reader – to cherish for generations. to be Good, and Kitchen Boy.